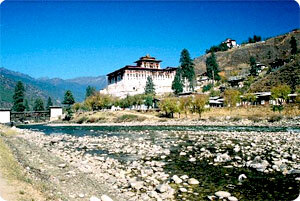 Tashi Chhodzong (Fortress), after 16:30 hrs. Overnight: Thimphu | Altitude: 2300m. - Drive to Punakha over Dochula pass at 3150m. From the pass, weather permitting, we will be able to see the entire Bhutanese Himalayan mountain range - a truly spectacular view! Evening: Punakha Dzong and Souvenir making center. Overnight: Punakha | Altitude: 1350m.